Simple Organic horse care is the answer to something that can be so complex, just too many choices! For the past 30 years I have been using some very simple things that have made my life easier. Products that are organic, nontoxic, economical, earth friendly---and as a bonus, they WORK really well!!! Listen to our own Coyote Chorus Here .... WARNING---dogs in the room tend to go a bit crazy and try howling themselves! DISCLAIMER---The following statements are my PERSONAL experiences only. They are anecdotal in nature and might not work for everyone. This is an organic cleaner that I have chosen to use as a non-toxic fly spray. I have used this with good success in my horse care for over 30 years. As with all organic and/or non-toxic substances, plants, etc, some could possibly have a reaction. Happily, I discovered organic, nontoxic fly spray that only costs about $1 for 16oz. I have tried just about every fly spray on the market, and nothing is 100% effective, nor does it last for days on end, even tho advertised as such. Most are spendy big time, and most make me sneeze or cough. What they are doing to my beloved horses I hated to think! I have been buying this great organic cleaner in 5 gallon buckets, but it is also available in a super concentrated formula in smaller containers (also available in 64 oz. My ''home made'' fly spray works nearly as well as anything on the market, yet I have the security that it will not harm my horses or me! Yes, flies still land and occasionally bite, but no more than with the other sprays I have tried. Spring is Gnat, or No-See-Um season, and they bite all horses, dogs, and people. The spring winds may drive us nuts, but it does blow the gnats away!!! Solution? Put a teaspoon or so of full-strength Organic Cleaner on your hands, and gently rub on all sides, inside included, of dog and horse ears. Rub some under your hat line and around your ears and neck. Once again, not 100%, but close enough, and NonToxic!!! Summer Mosquitoes??? Give the same full-strength Gnat Suggestion a try!! Horse care, simple and organic! The big sprayer is much easier to fill, much easier to spray, and I no longer have to fill small bottles OR squeeze them; the hand tends to get really tired after a few horses!!! Easy horse care! Details of my Formula can be found HERE! Pilar is 30 and does not love being sprayed, but sneaking up on her when she's chowing down on her Equine Senior really works! After riding, I use a spray nozzle attached to the farm faucet hose-- the horses get a great bath since the Fly Spray is an organic cleaner as well! When all the sweat and dirt is gone and they have dried a bit, i re-spray for the flies. Usually they roll in the dirt after that, but at least the sweat is gone! For just plain washing, I soak a big sponge with water and apply a drop or two of the Concentrated Organic Cleaner, scrub away, and rinse thoroughly. Simple, easy horse care! Oh Yes, how they love to roll in the dirt! I use this same organic product when any of the horses gets a cut or bite that is bleeding. I put it on straight, from a 4 oz. squeeze bottle. It helps stop bleeding and pain. After a few hours, I switch to Wonder Dust wound powder. It's activated charcoal aids in healing, and makes horse care very easy. Our old mare, Pilar, was gored by a Buffalo a couple of years ago; I was in Florida at a convention, but Tom was able to doctor her just fine with only the Organic Concentrate! For the complete story, read here about Tom's Buffalo Shuffle, AKA Buffalo Capture! SHEATH CLEANING -- explained with a sense of humor!! Stick my hand up where!? One of the joys of owning a gelding is periodic sheath cleaning. This is a mysterious topic to some, so Pat Harris wrote these instructions which she posted on Equine-L.
Equine Melanoma has haunted horse owners for centuries, and there has never been a cure. Need some Horse Colic HINTS? Colic hint horse care ---this page includes my personal experiences of horse care for colic, which might be of interest to you too. Mange and various fungi can be a big problem with horses. Thankfully our have had none of this for a very long time!! But an amazing germicide that i have used for decades really takes care of the problem -- simply put one or two Tablespoons of the germicide in a a gallon of water, thoroughly wash the effected areas, allow to sit for a couple of minutes and then thoroughly rinse with clean water. Blankets can also be washed in the germicide. 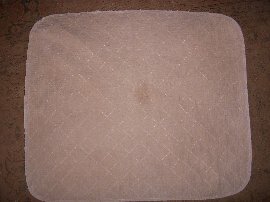 Is your saddle blanket getting sweaty and dirty? Boy are they hard to get clean again; too big, too covered with hair and sweat for the clothes washing machine. They never get clean enough when sprayed with water. MY NEW SOLUTION for easy horse care?? Underpads!! Yes, my friend Boyd sells ''reclaimed'' ambulance/hospital/nursing home pads, he calls them EZ Whelp. 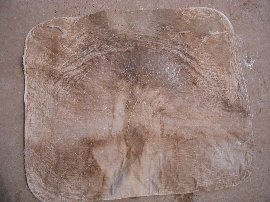 Just see the difference between the clean pad and the after a ride pad!! i LOVE that the hair and sweat and dirt are no longer on my good saddle blankets!!! and it leaves no residue to harm the horses' backs. I am SO THANKFUL for these amazing products--- for horse care, human care, earth care. I have loved them for over 30 years. They continue to work Fabulously well, and while Saving Money, I'm also Saving The Environment!! 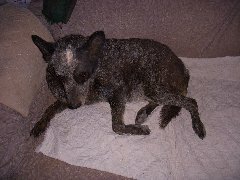 These pads are terrific for many uses....here is our sweet Australian Cattledog, Kanga who, at nearly 13, has some incontinence, and this has been a great solution! Flies annoy every horse, every dog, every critter in our lives, not to mention how they bother us!!! Flies make many birds and bats happy, but they just can't keep ahead of the population! 3 years ago my vet & friend told me she had been using Predator Flies for 3 years and it was really helping, and just got better as the years went by. So we decided to try them too, as part of our regular horse care routine. We started getting Monthly Shipments of flies, put them in their little Hatching Stations, and now our fly population is WAY DOWN from what it used to be! We also have them around the yard at the house. To quote from the SourceBiofly website, this is how they work--- Fly Parasites are BENEFICIAL insects that attack flies. Putting them in areas of fly breeding is an easy and cost effective method of Biological Fly Control. Fly problems occur as a direct result of excessive fly breeding. Each day, countless numbers of flies will emerge from an untreated breeding site. All day long, every day, you get more flies. Before long, spraying the flies becomes a losing battle,like putting a bucket under a leaking faucet. Doesn't it make more sense to stop the leak? We also keep a few Rescue Fly Traps around the barn, although we use far fewer since we discovered the Predator Flies! I met Gloria Muscarella almost 20 years ago, and we have been sisters ever since. She has amazing photographs at Cheval Photography; she specializes in Frisians, WOW!!! Also visit her darling Happy Horse Toys, and Happy Mules, Happy Doggies, Happy Critters!! My friend & neighbor, Rich, has terrific Horse e-Gifts --- fun and functional gift ideas for every horse-lover (even if it's you)! Trot in for home décor, jewelry, apparel, toys, games and more. Our pond does not always have this much water, and in winter it's totally frozen over..... so I was thrilled when I found THE most amazing automatic waterer!! 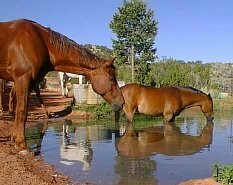 If you are ''Water Challenged'' as we are here in New Mexico, this might be just the solution for easier horse care for you as well! What Other Horse Crazy Friends Say!